Canadian Dupuytren Society | Do you have Dupuytren’s disease (without realizing it)? 22 Jul Do you have Dupuytren’s disease (without realizing it)? What do the Vikings, an eighteenth-century physician-surgeon and our great pianist André Gagnon have in common? Each of them has an extraordinary story. Once, long ago, a disease was named after the surgeon who identified it in 1831. His name was Guillaume Dupuytren and his story could have been told in a great novel if his pretentious nature hadn’t angered his peers. He was given many nicknames that reflected how unpopular he was: “The Beast of the Seine” (he practiced in Paris), “The Brigand of Hôtel-Dieu”) (he appropriated his assistants’ discoveries) and “The Napoleon of Surgery (for his tyrannical leadership). It was said that he was “first among surgeons and last among men.” Nonetheless, he was one of the greatest surgeons in the early 1800s. Everything about him was out of the ordinary. Guillaume Dupuytren was born on October 4, 1777 in a village not far from Toulouse, France. Kidnapped at the age of 3, his father managed to find him and bring him back to his real family. Not wanting his son to follow in his footsteps as a lawyer or yet, decide to enlist in the French army, he enrolled him in medicine. Very gifted, he completed his course in just three years and was hired by the Hôtel-Dieu de Paris as a surgeon. “It was in 1831, four years before his death, that Dupuytren operated on the disease that bears his name. After waiting for many years in the case of a man with classic fibrosis, Dupuytren first dissected the affected hand. He then operated on a wine merchant and made medical history. The surgery consisted of a fasciectomy (surgical release of the tendons), ‘the patient’s hand being firmly secured,’ by passing through an incision under the skin. After eight weeks, the finger regained normal movement. This learned anatomist surgeon not only did a lot for defining this disease but also for treating it. 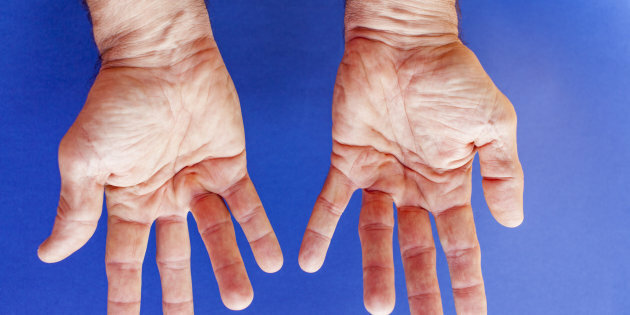 Why is Dupuytren’s disease also known as Dupuytren’s contracture? The disease affects one of two hands (rarely both). At a more advanced stage, as Professor Dupuytren accurately described it, more than three centuries ago, the disease results in the ring finger and little finger remaining folded up over each other in the palm of the hand. This disease progresses in four stages, with the first stage often going unnoticed. The disease actually begins with slight swelling in the palm of the hand (inflammation of a palm nodule) at the junction of the hand and ring finger. This bump is somewhat painful. But with time, the pain disappears. Then the second stage begins: the finger develops a slight curvature inward and can no longer remain straight like the other fingers. When this curvature forms more than a 90-degree angle, the disease has reached its third stage. At stage 4, the phalanges have completely curled up into the palm. Often mistakenly confused with trigger finger, especially when it begins to progress, the causes of Dupuytren’s disease remain unknown. In the case of trigger finger, the tendons are the cause. With Dupuytren’s disease, collagen fibers are responsible for the fingers retracting (most often the ring finger and little finger) towards the palm of the hand. No cause has ever been attributed to Dupuytren’s disease. Although it is unknown why this disease most often affects people with epilepsy and uncontrolled diabetes. Some have suggested, and again without evidence, that manual workers may be more easily affected. The only thing that is known for sure is its genetic origin. In fact, this disease is practically never found in African (at most 8 cases reported), Indian (10 cases described) or Vietnamese (only 1 case) people. It is believed that Dupuytren’s disease has a Nordic origin and that the gene was spread during the Viking invasions in the 12th century in Europe and French and English colonies. The disease mostly manifests after the age of forty and affects 6 times more men than women. Since it is more common in people of Nordic descent, the typical case is a man in his fifties with blond hair and blue eyes according to the Sandip Hindocha, Duncan Angus McGrouther and Ardeshir Bayat study entitled Epidemiological Evaluation of Dupuytren’s Disease Prevalence Rates to Etiology. The study was published on January 15, 2009 in the journal of the American Association for Hand Surgery. Closer to home, Radio-Canada informed us that our renowned pianist André Gagnon had to put an end to his career for more than 15 years and that one of the reasons that led to his absence was that the musician suffered from Dupuytren’s disease. Fortunately, the treatments that he received were a success and since 2010 we have been able to enjoy his return to the piano. Of course, the earlier the disease is diagnosed, the easier its treatment will be. So, if while reading this article, you think that you may have any of these symptoms, we strongly encourage you to consult your doctor who will refer you to a specialist.